Season Subscriptions and Single Tickets on sale NOW. Mendelssohn's Elijah with the Ars Viva Symphony Orchestra and soloists Michelle Areyzaga, soprano; Susan Platts, mezzo-soprano; Klaus Georg, tenor and Gerard Sundberg, baritone. 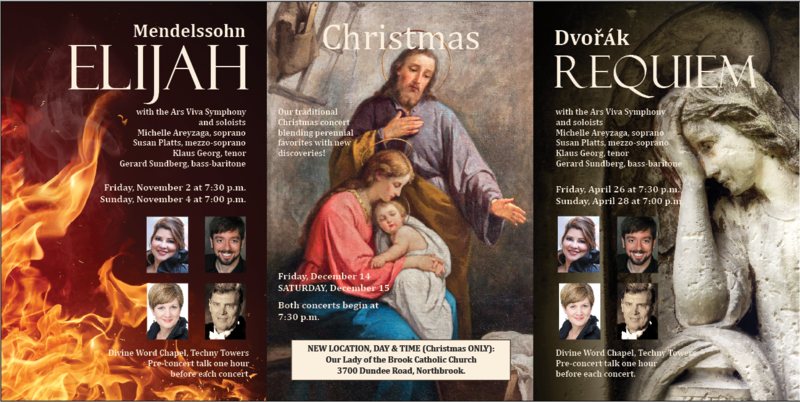 Our traditional Christmas concert, with Ars Viva musicians, blending perennial favorites with new discoveries. Typically a sell-out so get your tickets early! Dvorak Requiem with the Ars Viva Symphony Orchestra and soloists Michelle Areyzaga, soprano; Margaret Fox, mezzo-soprano (see below); Klaus Georg, tenor; and Gerard Sundberg, baritone. NOTE: Susan Platts has been replaced by Margaret Fox due to an unforeseen conflict. Fall and Spring performances of Chicago Master Singers are held at Techny Towers, 2001 Waukegan Rd., Techny (Northbrook), Illinois. Ample Free parking available. ​Techny is actually within the boundaries of Northbrook, on Waukegan Road (Route 43) one mile north of Willow Road.